Craftiepants 123...: Happy Bird-day, Tweet Heart! Hi card makers! 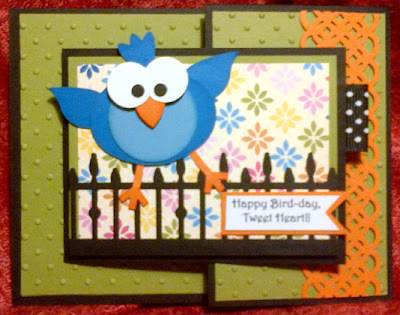 Here's a cutie for you - made it for my friend and fellow card making fanatic, Tracey. Tracey is 12 years old, soon to be 13, and is only the 'kid' in any of my adult card making classes. She is a very talented girl, and not only keeps up with the class, but is one of my star students!! 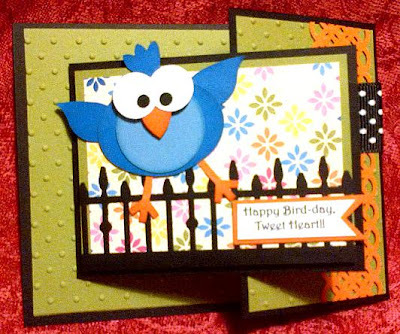 Tracey is a very shy, sweet girl and somehow reminds me of a little bird, so I made this bird card for her birthday, which is extra special this year as she becomes a teenager! It is a card in a card, a very versitile design and can be changed up for any occassion. And I got to use my new Martha Stewart Rod Iron Fence punch - bonus! F.Y.I., whenever I attach ribbon to a card as a tab, I always back it with a punched shape of matching cardstock to add strength and cover the mechanics. Awww Jen that is sweet -- I will keep it and this post a surprise until she sees the card! Jen I saw your card on SCS and linked over, it is adorable! I know she loved it too! I'm a challenge coordinator for Operation Write Home and I'd love to use your card as inspiration for a challenge on our Stars & Stamps blog. Here's a link to the Operation Write Home website so you can check it out. 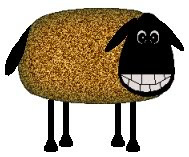 Happy Birthday - to EWE! !